Gaea Aeolus (right), one of the six defendants, and Hollis Higgins with Veterans for Peace. The women clad in floral patterned dresses and floppy hats march onto the train tracks in East Central Spokane. 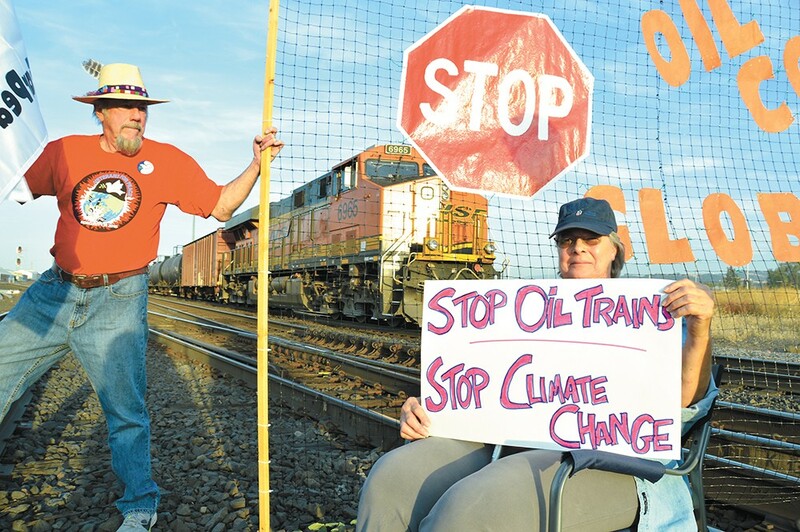 They hold signs condemning coal and oil trains — "Coal and Oil Planet Boil," one of them reads. They know they're breaking the law. "Even though we're committing what may be considered a criminal act, it's defensible because the harm that might come of our actions is of less import than what we are trying to prevent," says Nancy Nelson, who on that day in 2016 sported a hat with a pink flower to match her dress. "For us, that seems very easy." Nelson, 71, is part of the local gaggle of "Raging Grannies," an international network of activists who use humor, satire and and "unladylike antics" to raise awareness for social justice issues. She, along with five other people, were handcuffed and booked into jail in August and September last year for trespassing onto Burlington Northern Sante Fe rail lines. The six did so to protest the oil and coal train corridor that runs through Spokane and, they say, those trains' contribution to global climate change. They're each currently facing misdemeanor charges of second degree trespassing and obstructing or delaying a train. This week, they'll argue to Spokane County District Court Judge Debra Hayes that they have exhausted all other options to lessen the human impact on the climate. For these six people, standing on those tracks was akin to the Revolutionary War, the Underground Railroad and lunch counter sit-ins of the 1960s: They had no choice. That argument — known as a "necessity defense" — has been tried recently in the Northwest by other climate change activists, with little success. The biggest hurdle, says Eric Christianson, the attorney for the six activists, will be showing the judge that they had no other legally viable options. This Monday, three nationally recognized experts will also testify in court as to the impacts of climate change and the dangers of transporting volatile oil through a city by rail. It's up to Judge Hayes whether she'll allow the six to present the necessity defense, and the expert testimony, to the jury. "All of us feel as if we have done what we could legally," Nelson says, "and at some point there comes a time when we feel we must do whatever can be done to prevent further damage and stop it." Nancy Nelson, one of the three Grannies pictured, has written letters and met with members of Congress to address climate change — with little effect. For Nelson, a social justice activist for decades, civil disobedience out of necessity dates back to at least 1985, when she was arrested for the first time. Back then, she was part of a group of people who stood on tracks in order to block the so-called "White Train," which they believed carried nuclear warheads from Texas to Bangor, Washington. In that case, a Spokane judge allowed the group to argue a "necessity defense," and the case was dismissed at trial — though for unrelated reasons. "We had a friendly judge," Nelson says now, chuckling. "He managed to dismiss the case ... because they didn't identify me as a woman." Looking around the region at other climate activists charged with crimes, the six defendants realize that their necessity defense is a long shot. But they're encouraged by others' recent attempts in Washington state to make the same argument. Just this month, high-profile climate activist Ken Ward was convicted of burglary in Skagit County after he shut off an emergency valve on a tar sands pipeline that delivers crude oil from the Canadian province of Alberta to Washington. Judge Michael Rickert did not allow Ward to argue a "necessity defense," and drew national attention to the case with his statements in open court this past January: "I know there's tremendous controversy over the fact whether [climate change] even exists. And even if people believe that it does or it doesn't, the extent of what we're doing to ourselves and our climate and our planet, there's great controversy over that." After the first Skagit County jury could not reach a verdict, Ward was convicted of burglary in a second trial. He faces a potential 10-year sentence and $20,000 in fines. However, in another Washington state case, five defendants were acquitted last year of charges of blocking or obstructing a train. That group, known as the "Delta 5," built a tripod of steel poles across train tracks in Everett and remained there for eight hours before being arrested. Last year, a jury convicted them of trespassing, but acquitted them on charges of obstructing a train. That means BNSF could not demand that they pay restitution — a major victory, climate activists say. "That's where they can try and get you," Christianson says. "They can try to jack up that restitution to try and discourage others from doing it." Although the judge in that case did not allow a "necessity defense," the Everett case has Nelson and her co-defendants — her husband Rusty, George Taylor, Gaea Aeolus, Margie Heller and Deena Romoff — feeling optimistic. "I think we might have a small window to get that necessity defense in," says Taylor, 77. "But even if we don't, we can go into the trial and our attorneys can put us on the stand, allowing us to tell the jury why we did this." Taylor is referring to the controversial strategy known as jury nullification — where the jury can take the law into its own hands and acquit the defendants because it believes the laws are unjust, regardless of guilt or innocence. But if both of those tactics should fail, the six senior activists have at least one more fallback plan. They're suing the United States. This January, before their arrests for standing on the BNSF tracks, these six people signed onto a lawsuit against the federal government. Along with Gunnar Holmquist, a local doctor and member of Direct Action Spokane, they claim that a federal law preventing local governments from enacting regulations to stop climate change is unconstitutional. Specifically, the lawsuit cites the Interstate Commerce Commission Termination Act of 1995 as the reason why the Spokane City Council reversed course on a couple of ballot measures last year that would have barred fossil fuel transportation by rail through the city. A similar lawsuit in Oregon gives hope to the seven people in Spokane. In that case, 21 youths from across the country claimed that the government's actions were causing climate change and were therefore violating younger generations' rights to "life, liberty and property," and "their obligation to hold certain natural resources in trust for the people and for future generations." In a landmark decision, U.S. District Judge Ann Aiken ruled last November that the lawsuit can go forward, a decision that suggests citizens have a fundamental right to a stable climate.